PortaBilling can be installed in both private (your own servers in your hosting facility) and public clouds. 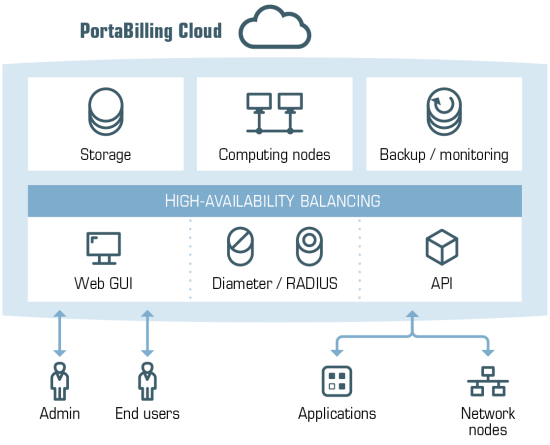 PortaBilling in a public cloud is available as an all-inclusive service where you do not need to purchase any licenses, procure the hardware and arrange the hosting. Instead, you may simply decide on the starting cloud billing capacity you need for your project, and we instantly provide you with a ready-to-use billing platform operating in a cloud. With PortaBilling in a cloud you can start your business faster and speed up payback. Even when your operational demands change as your business grows, you can instantly scale up your cloud billing installation without any capital expenditure. Usage based service subscription fees that are based on maximal number of concurrent calls and the amount of billable events processed by the cloud billing on a monthly basis. Quickly install a staging system to verify new functionalities and features introduced in the maintenance releases before updates, perform internal interoperability tests with the third-party equipment and applications, and organize trainings for new employees as well as for resellers and distributors. With PortaBilling in a cloud telecom operators and service providers obtain an advanced flexibility in managing their cloud B/OSS infrastructure. Reduced deployment budget enables businesses of all sizes to become active players at the telecommunications market in no time.